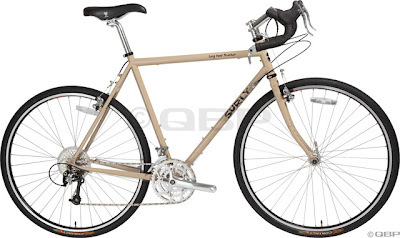 Our bicycles from Raleigh, Giant, Masi, and Electra have been selling well as usual, but we've also had a good run on Surly Bikes already this year. We received four Surlys yesterday, including the two Olive Green Long Haul Truckers shown here. The one on the left is decked out with matching front and rear Jandd cargo racks, and the one on the right had the bar-end shifters replaced with down tube shifters, black bar tape replaced with tan, and topped off with a Brooks B-17 Honey saddle. The hit of the season so far has been the Long Haul Trucker in the new color known as Truckaccino. The coffee-with-cream shade is really set off well by the all-black decal set (see photo below). We've special-ordered two or three of them already for our customers. 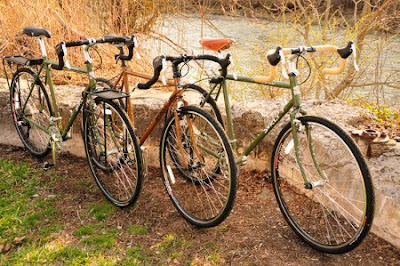 Surly has taken a lot of flack over the years for their unique color choices, and none has generated more controversy than this year's Cross-Check in Beef Gravy Brown (middle, above). It actually looks a lot better in person than the pictures can do justice to. We've got a 54cm model in stock in Peninsula, so come check it out! We've also got a 62cm Cross-Check in Misty Mountain Gray in Rocky River, a 56cm Cross-Check in Black in Medina, and a 54cm Long Haul Trucker in Blue in Peninsula. Availability and location are subject to change, so call us first before you take the day off work to come in for a test ride! You forgot my favorite Surly color...Chum Bucket Red. Mad1, never forget about the long forgotten Boston Baked Bean Steamroller. Yikes. I like those earthy colors. But I am afraid that the tandem would get mad at me for riding a Surly since they also make tandems and I ride a Santana.